Have you ever experienced an emotion such as this for another? Have you felt at times you heart may burst with the hurting when someone you love is walking down a road you know will lead to pain? The above definition clearly states that it is not the action of a bystander, but one who is actively walking with the one who is hurting. That is an image of God’s love and compassion. His word reminds us that he never leaves us nor forsakes us in Isaiah 41:10. Yet when we are in that valley, it sort feels like we are alone. In Psalm 23 we are reminded that we are guarded by a faithful shepherd and our cup runs over with the good that He has planned for us. The compassion of God is extended toward those He loves. Out of the abundance of His glory the rod of righteousness extends my direction. Compassion is not earned, it is given, like the gift of Salvation offered to all through the redeemed & risen miracle of Christ’s atoning sacrifice. Our finite mind can not understand compassion for we are too often ruled by our feelings, which are fleeting. Even a mother’s love, that strong bond, can be filtered by experiences like: pride, hurt feelings and even our exhaustion. Yet, God is not like man, His ways are higher than ours. His thoughts are higher than ours. His thoughts transcend the boundaries our humanness place upon us. Do you ever over think a situation? What conclusions do you arrive at? And… was it worth your time? We can’t out-think the holy. We can’t out-see the original visionary. We can’t out-love the originator of Love. Compassion starts at the mercy seat of the Almighty. Synonyms of compassion are: kindness, charity, clemency, sorrow, tenderness, mercy, sympathy, condolence. Antonyms of compassion are: cruelty, malignity, barbarity, savagery, harshness, indifference. There are times in my life where my actions did not speak of compassion for others. Seeing the words above caused me to stop and consider one word more than the others. I would never identify God with being cruel, barbaric, savage, or harsh but the last word… indifferent…. that one stumped me a moment. I know I have been indifferent at times. I know I haven’t always shown kindness, tenderness, or mercy at times when I have felt pushed, pulled and disrespected. I can honestly say, I have felt indifference. Now that I look at the definition of compassion and the image it conjures of a loving and faithful Heavenly Father, I further aware of what His compassion means. He is not indifferent to my situation and unlike me, His patience and long-suffering are immeasurable by human standards. No matter how far I go, or fall, He is still there. He still has compassion. As a mother I find that the road I travel is often on my knees, though maybe not often enough. I have seen the heart of my children broken by the circumstances of life and had to watch knowing there was nothing I could do. Through my own grief, I cried out for compassion. I sought the One who knew their pain intimately because like me, He has never left them. I sought His Wisdom and even asked ‘Why?” The answer wasn’t what I had hoped,but much more than I could dream. It was a peace of knowing that no matter what this life brings, I am not alone. His Spirit fills fully and His ability to meet us in each and every circumstance goes beyond our ability to understand. Yet in His presence, we can be assured of the gift of His peace. Over and over in his Word I am reminded that where He is, Peace remains. I am confidant that in all things He is worthy of my trust and in each moment, He is worthy of my praise. My problems, concerns, hurts, may be monumental in my own estimation, but they are not in comparison to God’s ability. His presence is the promise, it is the guarantee, to the hope that is abundant. In that, I can face the trials of life. In His presence, I can be confidant that He knows what has burdened my heart. In His presence, I can find hope that overcomes the disappointments of life. 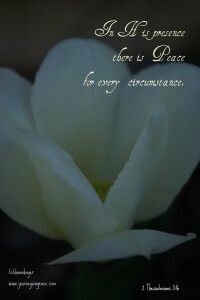 In His presence, there is peace to overcome every circumstance. Praying for you to know the peace that passes all understanding. Praying that the Lord would fill you with the peace of his Presence. Praying that in the middle of your circumstance, you will know that you are being held, even cradled, in the palm of your Heavenly Father. Please feel free to send a prayer request or share in the comment box below.